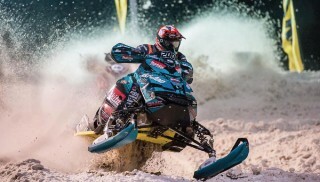 Wipe the slate clean, hit the reset button and get ready for a new season of AMSOIL Championship Snocross Presented by RAM. Thanks to a fresh blanket of snow by Mother Nature, the teams have rolled into Duluth to crack the throttle and throw the roost for the first time since March. Reigning PRO Open champ, Tucker Hibbert will return to defend his championship season along with Montana Jess in the PRO Lite division looking to repeat his rock solid 2016 Season. Expect big things to happen in the PRO Open ranks with the rocket Elias Ishoel moving up from PRO Lite and the return of Kody Kamm on the line, no doubt the battles will be epic and keep the fans on their feet. Starting off the weekend will be the AMSOIL Dominator, a one-on-one battle in a two lap race to the finish, the winner moves on, the loser to the trailer. Tim Tremblay (11) and Ross Martin (837) are the top winners in the past AMSOIL Dominator races, will they take the top of the box, or will a new challenger etch their name in the W column? Grab the bars and hold on cause it is about to get wild, it’s go time in Duluth. After two rounds of elimination, many top riders were off to the bleachers to watch Round 2 and the Semi’s. Tucker Hibbert (68) moved to Semi- Final but was beaten out by Kyle Palin (324) by a fraction of second, Palin will sit on the front row of the Final Round. Hibbert would still have a chance in the LCQ where he would finish first and take a spot on the back row of the final, however Hibbert was unable to take the green flag due to a mechanical issue. The rocket Elias Isohel (200) who moved from the Pro Lite division into the PRO Open this year, fell behind Petter Narsa (54) early on in the first round, but came back with huge air over the AMSOIL Finish Line jump to close the gap and take the lead and move onto the Semi where he would also take the win and move to the final round. Adam Renheim (311) and Ross Martin (837), Tim Tremblay (11) , Corin Todd (36) and Ryan Springer (541) all made it to the Semi rounds, but would fall short when the checkers flew at the line. In the final and on the line it’s Kyle Pallin (324) and Elias Ishoel (200) up front, with Ryan Springer (541) taken the only runner-up spot with Hibbert out. Off the line and out of the shoot it is a battle to between Elias and Palin, bar-to-bar into the first turn where Elias would move into the lead and never look back taking the big $10,000 payday to the bank and striking first blood in the 2016-2017 Season. Be prepared for big things to come from this hot shot throughout the season.